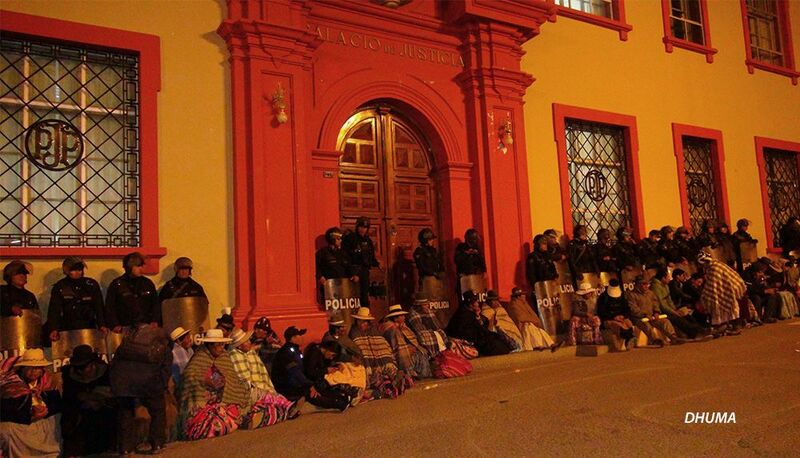 Este artículo está disponible en español aquí This past month, eighteen Aymara community leaders endured the final stages of a trial that had them facing up to 28 years in prison and massive fines for their alleged roles in the 2011 ‘Aymarazo’ protests against the Santa Ana silver mine on the Peru-Bolivia border. 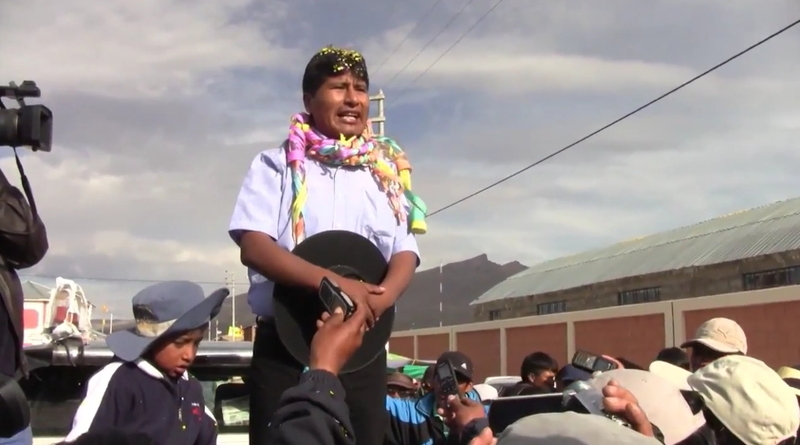 The group of Aymara leaders stood accused of obstructing public services, disturbing the peace, and committing aggravated extortion against the state. Seventeen of the accused were acquitted of all charges; however, on July 18, Walter Aduviri was sentenced to 7 years in prison and ordered to pay a 2 million sol fine (over $600,000). 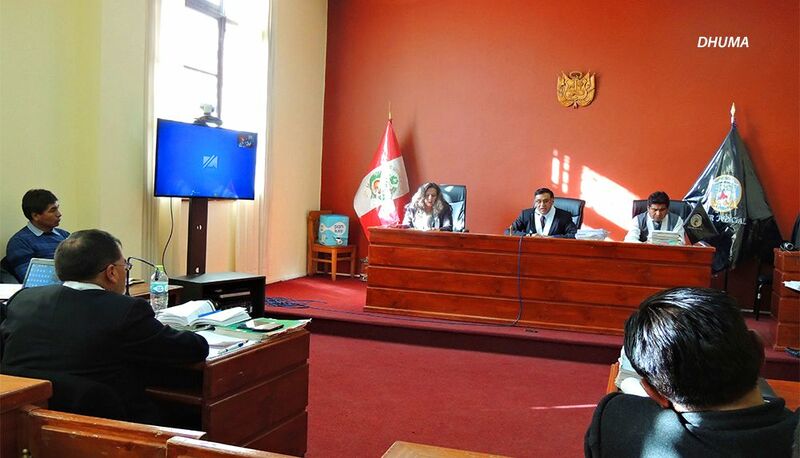 His lawyer, Martín Ticona, speaking to the crowds in Puno after final sentencing, indicated irregularities in the judicial process and said that they will appeal Aduviri’s sentencing. The prosecutor, Juan Monzón Mamani, also intends to appeal the decision for reasons that are not yet clear. Initially, 100 Aymara had criminal investigations brought against them after the ‘Aymarazo’ protests in the southeastern region of Puno. The investigations were dropped against 82 of the Aymara, leaving just eighteen to stand trial. They had all been equally charged with obstruction of public services, disturbing the peace, and aggravated extortion. On June 28, the accusations were withdrawn against eight leaders—including Francisca Sarmiento, the only woman charged—due to lack of evidence. Ten went on to face sentencing; but only Aduviri was found guilty, for the charge of disturbing the peace. The accused have paid a heavy price over the past six years – not only in terms of time and money spent to attend numerous court hearings and the heavy threat of 28-year prison sentences. They have also had to cope with the psychological trauma of criminalization, and the Aymara population at large have struggled with a dominant public narrative stigmatizing the Aymara population as alleged “criminals” or with labels such as “anti-development,” according to local organizations and activists. Rumors of the proposed mine began to circulate as early as 2004. Communities were immediately concerned about the proposed mine because of its sensitive location. Mining operations are inherently water-intensive and Santa Ana could also contaminate drinking water, affecting agriculture, livelihoods and food security for hundreds. While communities had found out about the mine through rumors in 2004, it was not until 2007 that the news became official when the government authorized the Santa Ana mine. Communities began to carry out a series of public petitions, administrative complaints and procedures directed at local and regional government and environmental authorities. 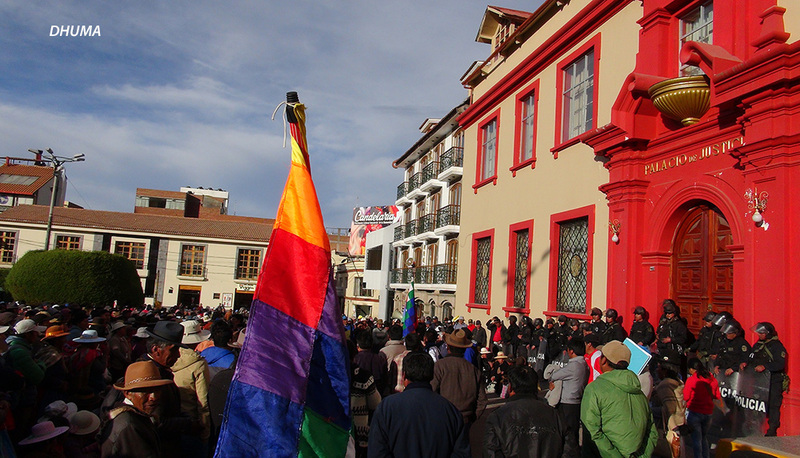 When their concerns remained unaddressed, demonstrations began to be organized in communities and towns all along the shores of Lake Titicaca, near the border with Bolivia, and in the city of Puno, where this steady resistance came to a head with the events known as the Aymarazo in March to June of 2011. Those protests culminated over several days in May in a mass mobilization in Puno of more than 15,000 Aymara people from all over the south of Peru, paralyzing parts of the city for days. Communities were calling for not just cancellation of the Santa Ana mine, but cancellation of all mining concessions since 2011, and a moratorium on future concessions, according to Rodrigo Lauracio, a lawyer with DHUMA, in an extensive interview with the authors. Indigenous territory in Puno province has seen a massive increase in permits for extractive projects over the past two decades, he said, consistent with nationwide trends. Bear Creek Mining Corp.’s public presentation of the company’s environmental impact study in February 2011, badly translated into Aymara in an undersized hearing room, only deepened public fears, according to Lauracio. The Aymarazo protests forced the government’s hand: They rescinded the controversial Decree 083 that gave Bear Creek authorization to proceed, effectively stopping the project. Repressive criminal proceedings are just one of the consequences of the Aymarazo mobilizations. But the repeal of the Santa Ana decree is also a factor in another lawsuit. In 2014, the company responded to that move by filing a $1.2 billion case against Peru at the World Bank’s International Center for the Settlement of Investment Disputes. Bear Creek contends that Peru violated the terms of its trade agreement with Canada by not allowing the mine to go forward. The hearings, which are ongoing, take place in a closed court in a highly undemocratic process. Bear Creek asserts that the Aymarazo protests were politically motivated. However, DHUMA and other supporting organizations say that communities rejected the project in order to protect their water sources, and because neither Bear Creek nor the Peruvian state followed correct legal procedures. The company’s attempt at community outreach manipulated communities and both the state and the corporation implemented their policies and plans with a complete lack of transparency, according to Lauracio, failing to even comply with national and international law on free, prior and informed consent. Peru has seen an increase in free trade agreements and a relaxing of environmental protection in recent years. These policies aim to facilitate the entry of transnational corporations and international investment into Peru, and mining and extractive industries have increased across the country. There has also been an increase in “… public policies that create new crimes against people who participate in social protests,” observed Lauracio. Peru’s wave of neoliberal and repressive policies not only gives extractive industry a helping hand but creates further mechanisms to criminalize resistance to extractivism in the courts. These mechanisms are designed to prevent further protests like the Aymarazo and help pave the way for future extractive projects. The repressive tactics of criminal proceedings go along with other forms of state criminalization. These are also present in the Aymarazo – such as the smear campaigns against social protests and those who organize and participate in them as violent criminals or “backwards” or “against development.” The state also intervened in Aymarazo protests in ways that sparked violence, such as the declaration of a state of emergency, which allowed increased repressive tactics and violence on the part of the armed forces and caused trauma, injuries and death. These dynamics are not just playing out in Puno, but across Peru, which currently has 39 mining conflicts registered by the Observatory of Mining Conflicts in Latin America. In the same week as the Aymarazo sentence, three community leaders from Espinar, Cusco, also faced sentencing in a trial for charges relating to protests calling for mining company compliance with environmental and health regulations. The criminal charges are related to protests over mining in 2012 in which five people were killed by Peruvian police during a declared state of emergency. The three have been acquitted—but they’ve gone through five years of unfair criminal proceedings. In another example of policies that criminalize and harm people, Peru modified its laws in 2014 to create a loophole that allows police officers to kill people in situations of social protests. The police are also permitted to contract with corporations to provide private security services. On one side, Bear Creek still has Santa Ana mine featured on its website (no doubt in the hope that its share price doesn’t drop, as it did after the 2011 protests) and the Peruvian state may be forced to pay $1.2 billion to Bear Creek, and could reissue the Santa Ana permit. On the other side, the Peruvian state seeks to jail Walter Aduviri and criminalize anti-mining resistance in a bid to silence future protests. Furthermore, they are demanding exaggerated fines, with an initial demand against the 18 for over $2 million, and Aduviri now sentenced to pay $600,000. To put that amount into context, the monthly minimum wage in Peru is around $270 – it would take 185 years of minimum wages to pay Aduviri’s fine. Aduviri has said that the trial is politically motivated, and that he is the target of political persecution. He ran for governor of the Puno province in 2014 on a platform many said was controversial, and has been branded as using the movement as a leadership platform to gain votes, by those seeking to discredit the demands of the 2011 protests. While he may be acquitted of the charge of extorting the state, he is charged with being the ringleader of not only the protest, but acts of destruction of state property that happened during the Aymarazo in 2011: his guilty verdict for the charge of disturbances labels him as autor mediato— indirect perpetrator or perpetrator-by-means. His being part of the leadership of a movement, his politics, and the widespread support he receives in Puno, seem to be included in the condemning judgment. Outside the courthouse on July 6, the day of provisional sentencing, hundreds of Aymara mobilized in support of Aduviri, crying, “If there’s no solution, Quechuazo y Aymarazo! [more protests].” Aduviri declared his innocence in a press conference on July 7. On July 18, the day of the final sentencing, he addressed crowds in Puno in a fiery speech, interrupted by shouts of slogans denouncing the prosecutors and judges as biased. Aduviri is not in jail because the sentence can’t be executed while his appeal is ongoing. With the verdict in the ICSID case due in September of this year, and Aduviri’s harsh sentence, the situation is a confluence of the state’s policy to criminalize anti-mining protests, and the toxic impacts of the tools of corporate power, like free trade agreements, when protests cause a mining project to be halted.